All eyes are on stock markets nowadays as markets finally react to rising interest rates. 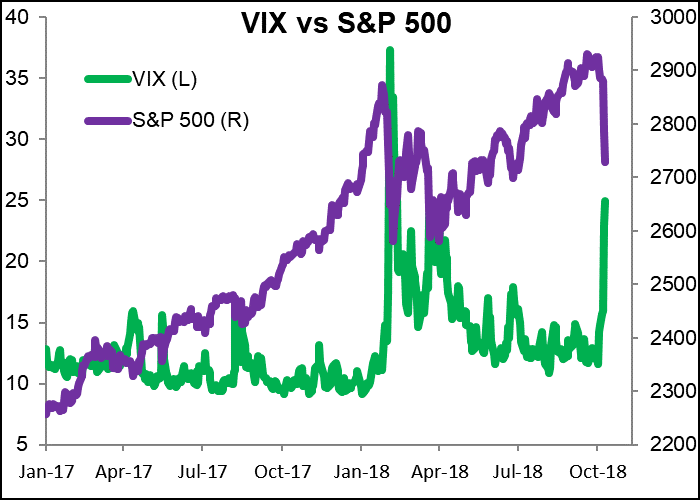 The S&P 500 has plunged while the VIX index, Wall Street’s fear gauge, has risen sharply (although not back to where it was when the market plunged back in February). 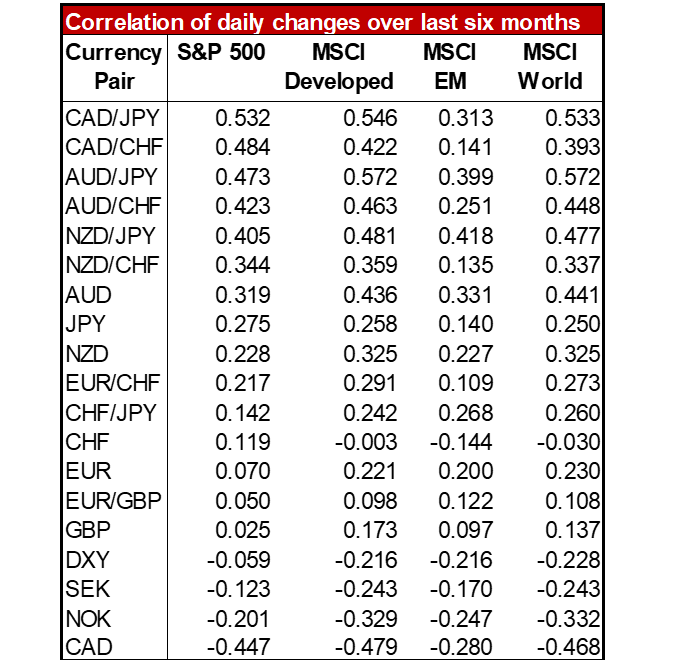 What’s the best FX trade to put on to take advantage of tumbling stock markets? 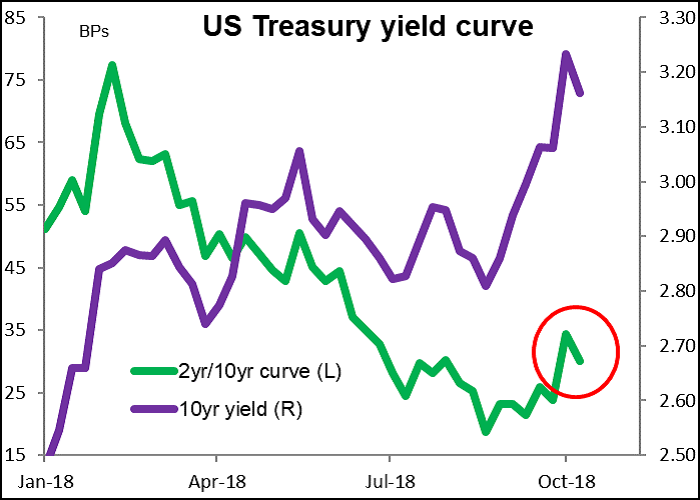 In any case though, sometimes a sharp move in the market causes other moves that counter the initial move -- what George Soros called “reflexivity.” As stocks have fallen, Treasury yields have fallen too. Ten-year yields are down almost 10 bps from Monday’s closing level and the yield curve has flattened somewhat. 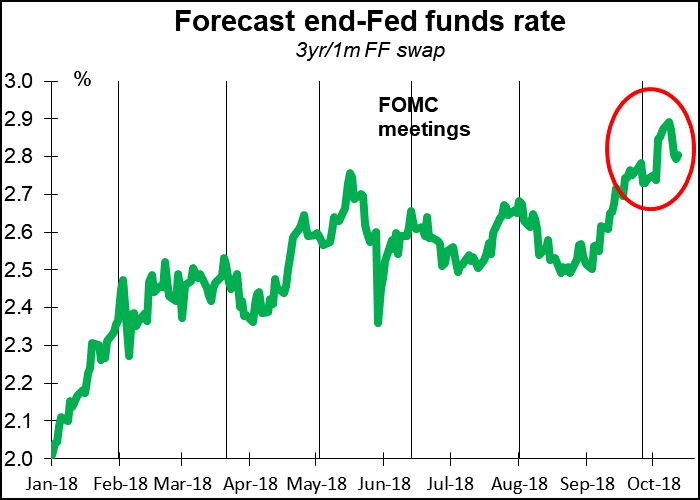 Meanwhile, the market has cut its estimate of where Fed funds will be at the end of the rate hiking cycle by 9 bps from the recent peak. It’s still above where it was before the last FOMC meeting, but it’s clear the market thinks that the turmoil in stocks will affect the Fed’s eagerness to hike. That should go some way to calming the stock markets. The fact that the US CPI came in below expectations may also help to calm fears of aggressive Fed tightening (headline slowed to 2.3% yoy from 2.7%, 2.4% expected, while core was unchanged at 2.2% vs acceleration to 2.3% expected.) The figures imply that the personal consumption expenditure (PCE) deflators will both be well below the Fed’s 2% target on a 3- and 6-month annualized basis. That should help to calm fears that the Administration’s tariffs plus recent wage rises will feed through to higher inflation and therefore faster tightening. Aside from stocks, the focus in the upcoming week will be on sterling as UK PM May travels to Brussels for a make-or-break EU summit. There will be a working dinner on Wednesday night to discuss Brexit (PM May will be eating alone at the fish-and-chips shop next door). Then the meeting of all the heads of government the next day has been billed as the “moment of truth” for the negotiations. If they can come up with a compromise on the Irish border question, they may be able to come up with some agreement on their trading relationship after next March. If not…bye bye Britain! The country crashes out of the EU with no arrangement in place with its biggest trading partner. EU negotiator Michel Barnier said the agreement is around 85% complete. Press reports say that there could be a preliminary agreement announced on Monday, to be approved at a UK Cabinet meeting Tuesday and then by the EU on Wednesday and Thursday. If there’s no press conference on Monday with the negotiators on both sides smiling, then look for the pound to fall sharply. On the other hand, there’s still plenty of upside potential if they do reach agreement. The summit will dominate sterling in what would otherwise be an important week for UK indicators. Tuesday we get the UK labor data; Wednesday, the CPI; and Thursday, retail sales. I think those are likely to have only temporary impact however as politics is much more important for now. Sometime during the week, the US Treasury is likely to release its semi-annual report on Macroeconomic and Foreign Exchange Policies of Major Trading Partners of the United States. US Treasury Secretary Mnuchin has warned China not to engage in competitive devaluations. “As we look at trade issues there is no question that we want to make sure China is not doing competitive devaluations,” he said in an interview with the FT. Although so far China has yet to be mentioned specifically in this report, it is possible that the Administration does name it as a “currency manipulator,” which would open up another front in the trade war between the US and China. 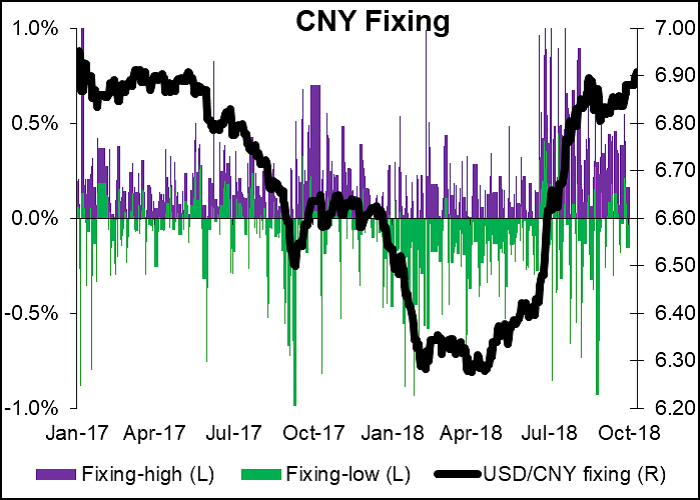 Note though that while USD/CNY been trending upwards (i.e., CNY has been weakening), the spread between the fixing and the high of the day (i.e. the weakest point for CNY) has been much greater than the spread between the fixing and the low. That suggests that in fact China has been restraining the downward pressure on its currency. I expect that given the market turmoil, the Administration won’t want to aggravate things any further and will give China a pass here yet again. 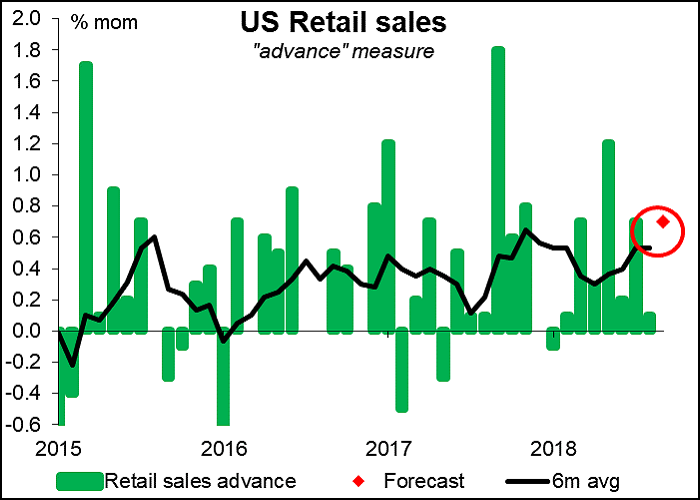 As for the US, the main indicator out during the week will be the retail sales on Monday. They’re expected to rebound nicely after August’s weak rise. That could help to settle peoples’ nerves somewhat. Other US indicators out during the week include two of the closely watched regional Fed indicators (Empire State on Monday, Philly Fed on Thursday) and some housing market data (starts & permits on Wednesday, existing home sales on Friday). Finally, the FOMC minutes on Wednesday should shed more light on the Fed’s thinking, even though we’ve already heard independently from many of that meeting’s participants.